Instead of going into alcohol, Coca-Cola's should look at an asset closer to home. It's been a tough run for Coca-Cola (NYSE:KO) of late. The company has provided investors a 42% return, including dividends, over the past five years, versus the greater S&P's return of 87%. 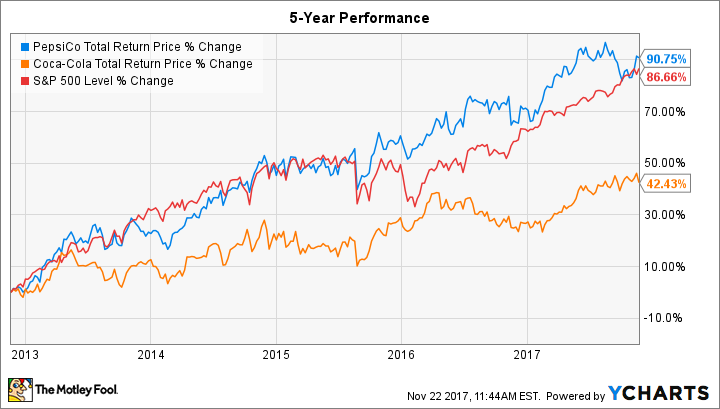 Compared with its biggest rival, PepsiCo, Coca-Cola's underperformance is more pronounced, as the former has provided investors a 90% return, double the return of Coca-Cola. We're looking at opportunities in growing premium segments such as adult craft beverages. As you know, more consumers, most notably adults, are seeking unique and distinct products with sophisticated flavors, quality ingredients, and smaller-scale craft production. Later, and after considerable media interest, Quincey walked back his comments by saying although he'd "never say never," he feels moving into alcohol doesn't make sense now. However, often the best solution is one already in front of you: Coca-Cola should lay off the booze and fully acquire Monster Beverage Corporation (NASDAQ:MNST). While Pepsi's outperformance is recent, the roots of the company's strategy are more than 50 years old. In 1965, PepsiCo was formed through a merger of the Pepsi-Cola and Frito-Lay companies. Since then, the company has operated as a food and drink conglomerate, buying beverages such as Tropicana, SoBe Beverages, and IZZE Beverage Company for growth and diversification. Recently, while soft-drink sales have slumped because of health concerns, Pepsi's other brands have picked up the slack. Coca-Cola has continued to focus on beverages, only recently turning to acquisitions to grow its bottom line. In 2015, the company took a 16.7% stake in Monster and added a strategic partnership to expand Monster's global capabilities. Since Coca-Cola accounts for Monster under the equity-accounting method, it's easy to see just how profitable its stake in Monster has been. In the company's recent earnings report, Coke reported the fair value of its investment in Monster Beverage Corporation to be $5.6 billion. Meanwhile, the carrying value -- the price paid, plus earnings, minus dividends -- is $3.4 billion. In the event Coke sold Monster shares today, it would have a pre-tax gain of $2.3 billion, or 68%. While the alcohol comment received more attention from the press, more telling was Quincey's other two prescripts for growth. The first was to identify and incubate high-growth brands; the second was to nurture and expand small brands internationally, whether in-house or by partnerships. While Monster may not technically qualify as a small brand, given its $34 billion market cap, it's due to the company's tremendous growth. We continue to believe in the company and our growth strategy, and remain committed to continuing to develop and differentiate our brands and to expand the company both at home and abroad, and in particular to expand distribution of our products through the Coca-Cola bottling system internationally. Coca-Cola already has a way to increase growth through an acquisition, and it doesn't require buying new, unknown companies or entering into new markets potentially outside its circle of competence. To consolidate Monster onto its financial statements requires a "control stake," often considered 50% or greater. In the long run, this would be money well spent.